Built in 1829, The Old Lodge is a pretty, Grade II listed gatehouse, perfectly positioned to be able to walk to the Victorian high street, the Lake Grounds, Lido and the Marina. 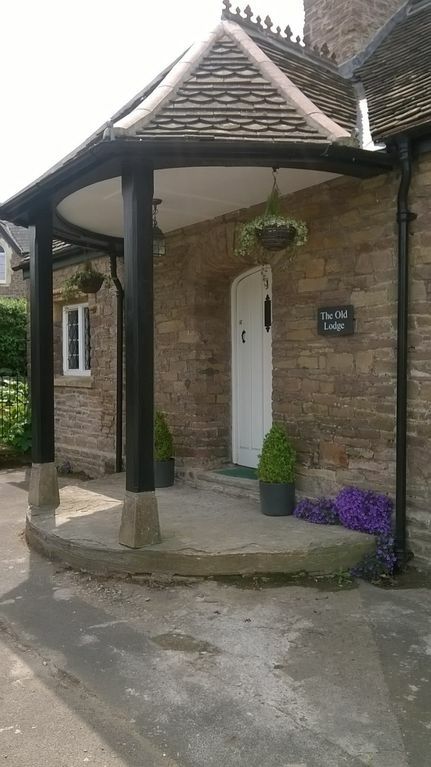 Small but perfectly formed, recently restored and renovated and with a fully equipped kitchen, The Old Lodge offers everything you need for a relaxing break. The Old Lodge has secure gated parking for one car, and plenty more on street parking nearby. The house, garden and driveway are all on one level, with one small step at the front door, and another small step at the back door. There are two double bedrooms that are very independent and private from each other. One bedroom has an en-suite shower room, and so the other has exclusive use of the bathroom with a shower over a mini-tub. The kitchen has a vaulted ceiling, an exposed stone wall, and a small table that can be pulled out to seat four. It has a fridge freezer, dishwasher, washing machine, microwave, gas hob and electric oven. There are several seating areas in the sunny garden, and a BBQ for when the weather's nice. Kitchen basics such as tea, coffee, sugar, oil etc are provided, as are clean towels, bedding and basic toiletries. You will find some provisions for breakfast the next morning, including fresh bread and fresh eggs. toilet, combination tub/shower, The main bathroom has a shower over a mini-tub. The house has a new and easily controlled central heating system with radiators in every room. Clean bed linen provided once a week. Clean towels provided once a week. A wood stove is available for use during winter months only. Basic kitchen supplies such as salt, pepper, oil and vinegar are provided. Freshly laid free range egss, bread and milk will welcome you on arrival. A small table in the kitchen can be pulled out to seat four. A childs highchair is available. There is a television in the sitting room and the main bedroom. The garden is secure, surrounded by hedges and railings. It consists mainly of wrap around raised beds and a small area of lawn. Beautiful well maintained property. The property is extremely clean. Jenny supplied everything we needed to enjoy our stay, even fresh flowers. I have stayed in a number of properties over time and personally I think this was the best. I hope to return sometime in the near future. We enjoyed our four night stay in The Old Lodge. A compact and well decorated ,spotless cottage with just a short walk into town.A high chair and travel cot provided. It is a very small cottage and think more suitable for 2 adults but fine for 2 adults and 2 small children .No stairs so this was a plus with a toddler. Jennifer was very kind and had left some thoughtful toys, dvd's ,children's books and bubble bath for our grandsons who stayed for two of the four days with us to give our daughter a break . An excellent welcome pack gave us all the basics we needed for breakfast . A short walk to the local tapas bar on the first night before we picked up the grandchildren and the local park and the lido were good for the children. The marina was good for coffee and we also took the grandchildren to the local library. The last night of our stay having returned the grandsons to Bristol we went for an Indian meal in the town where food and service were good. The Black Horse,where we had a pleasant pub lunch was just a 5 minute drive .I had the cheese and leek bake with side salad which was very good.The pub has a large car park at the rear. The Windmill pub was walking distance where we sat outside and enjoyed the view of the estuary. A very pleasant and comfortable short stay. Thoroughly enjoyed our stay in The Old Lodge which is small but perfectly formed. Our party consisted of two couples and we enjoyed the privacy both bedrooms provided. All rooms were spotless and the owner has clearly given lots of thought and care in decorating what is a warm and comfortable home with lots of character. The home is well equipped and it was lovely to find a comprehensive welcome pack awaiting our arrival. Finally, thanks to the owner who responded very promptly to queries throughout the booking process. The Lodge is a lovely building, with lots of thought gone in to make our stay perfect. It is quite central for shops, restaurants and the marina. We caught the local bus to Bristol, well worth a visit, and much better than driving in. Although the Lodge is situated on a busy road junction, it didn't spoil our comfort. Everything is in an excellent state and everything you might need you will find. When we arrived, fresh milk, bread and fruit were waiting for us. Kontact was easy, friendly and prompt. Lovely, welcoming, clean cottage. Central location. Would definitely go back! This is a lovely cottage which has character but modern facilities. It is well equipped with all you could need for a short break. The welcome food pack is very generous and above anything we have experienced elsewhere. The cottage is well placed for all that Portishead has to offer and is very clean and comfortable. The booking experience was very straightforward and smooth also. If I was requiring accomodation in Portishead in future, I would have no hesitation in returning. Best wishes Jenny - you are doing a great job! The Old Lodge was built in 1829 by the Bristol Corporation as a gated entrance to the genteel Woodhill leisure area. The gate has long gone but the gatepost can still be seen. If you continue to the end of Woodhill Road you find the Royal Hotel, a lovely pub built at the same time with lots of local history on display. Lovely walks can be had to the Marina Quayside and High Street, where you have great choice of restaurants, takeaways, bars and pubs. Just as close by are the beautiful Lake Grounds, with far reaching Channel views, boating lake, Coastal Path walks and all sorts of activities for all ages. The coastal town of Portishead is only 15 minutes from Clifton, Brunels famous suspension bridge and all the great City of Bristol has to offer. It makes a great base for exploring Somerset, Dorset, Cornwall and Devon and enjoying the beautiful regions of the South West. Portishead is 25 minutes from Bristol airport and 6 minutes from Junction 19 of the M5. The town has good bus links to the centre of Bristol and surrounding area, and there are several good taxi firms nearby. Portishead is on the National Cycle Network.